On February 1, the Administrative Court of Yerevan held a preliminary hearing on the case of Public Information and Need of Knowledge NGO (PINK Armenia) against the Yerevan Municipality. 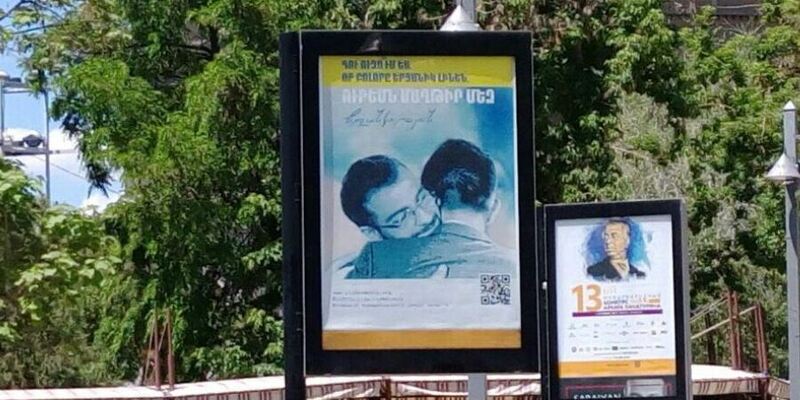 On May 27 of 2017, at the request of Yerevan Municipality, the “Nushikyan Association” agency dismantled social advertising that promotes tolerance towards LGBT people that was displayed on the basis of a contract signed with Pink Armenia. PINK Armenia’s claim was discussed at the session—namely, to recognize the actions of the municipality as illegitimate, restricting the freedom of expression of PINK , and obstructing the NGO from utilizing the right to be kept safe from discrimination. Judge Rafik Khandanyan, who heard the trial, demanded that Pink Armenia prove that the municipality violated Pink’s rights and not the Nushikyan Association’s. The representative of the municipality was required to present to the court evidence that the latter’s actions were legitimate and not discriminatory, and did not violate PINK Armenia’s right to freedom of expression. The municipality’s position is that the ads were deceptive and illegal because they have not been asked to give permission for the installation. The hearing was postponed until March 21, 14.00.